I am already getting questions about the Tony Awards ribbon or the black google ribbon and what they symbolize. Both were done to show support for the victims of the Orlando nightclub tragedy. I created a ribbon to symbolize the recent Orlando nightclub tragedy specifically. 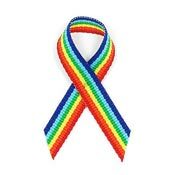 It is a combination ribbon with rainbow, white and black. 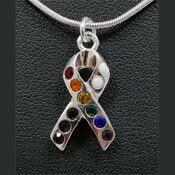 So now there is one ribbon that utilizes existing colors for causes and has a special significance to those who wish to support their family and friends. The rainbow for gay pride and support, black for mourning, and white for victims of terrorism. Many blessings from our family to the friends and family members of those who were lost and injured.